Corporate reputation, corporate reputation management and online reputation management are all becoming familiar terms to the world’s largest companies and their leaders. We at Reputation Consultancy are helping them to make sense of them all. As they come to terms with the consequences of digital communications; with a new generation of connected and engaged stakeholders and with the rapid speed of online conversations, the appetite to understand, measure and manage online reputations has never been so strong. From the corporate reputations of the FTSE 250 and the Fortune 500 to the local electrician at the end of your street, businesses across the world are waking up to the fact that reputation can make or break a brand and a business, in hours. Knowing how best to manage and measure that reputation in a digital world is now crucial for sustained success. If there is any doubt about the value of corporate reputation, simply take a look at the news. 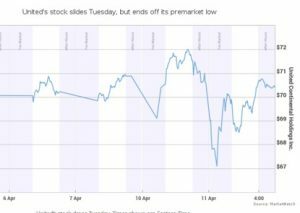 Just this week United Airlines wiped $1bn off its company value within a day by forcibly removing a man from an airline. Over just five days from the video footage being taken on a smart phone and being released to the media, the company has seen a rapid change in its share price and its leadership has publicly struggled with how best to respond. And reputations may tumble over night; they can also slope over many years. 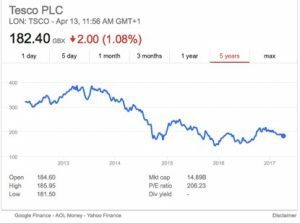 In 2014 Tesco wiped £2bn off its value, seeing shares fall 11.5% to an 11 year low when the CEO broke the news that profits were overstated. 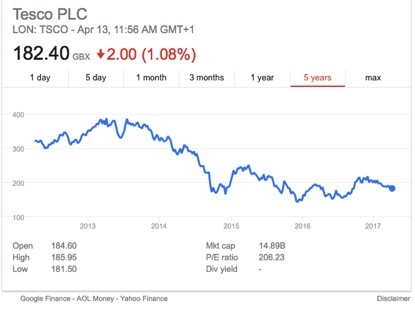 This five-year view shows a clear downward trend from the announcement of the story in September 2014. These are just two companies of many that demonstrate clearly the value of corporate reputation and the effect that it can have on the bottom line. One of the most significant changes in corporate reputation management is the shift from crisis management to asset management. The most simple rule of managing online corporate reputation is to accept that, while the risk is ever present, your online reputation is a valuable asset as demonstrated above. As such reputation, online and offline, is beginning to be actively managed. Every organisation and person have a reputation. Those with an interest in you own your reputation. A company or individual can only influence it. Reputation is an asset, not just to be protected but also to be actively managed. Reputation is not a brand. A brand is owned by the company itself, it decides on an identity that it aspires to be known for. A brand is the degree to which the company is successful at projecting its ‘inside- out’ message. The perceptions of how all your stakeholders are seeing and believing you must be measured at all times. Reputation Consultancy is one of the UK’s leading reputation agencies. We define reputation as 80 indicators of attitudes and perceptions about a company. Grounded in academic theory, global best practice and digital capabilities, these indicators form the basis of our reputation measurement framework. Different, to hold a unique position in its market. Who is having the greatest influence on reputation? How is that reputation changing over time, by day, hour and month? What are the conversations most affecting reputation? Which are the key emotions in the online content? These can often provide an early warning system of reputational risk. Which of the organisation’s activities is best supporting or detracting from its reputation? How does that organisation compare with its sector, its market or other benchmarks? Only once that reputation is evidenced through digital insights (and preferably additional stakeholder reputation research), it is possible to begin to set the ‘reputation aspiration’. Managing online corporate reputation is a five stage, continuing, process. Evidence. Having the insight and research to demonstrate what current reputation standing is. Gap Analysis. Working with the leadership team to determine the reputation that the organisation seeks to hold among all its stakeholder groups. A cross-functional approach. Engaging all functions, including risk, operations, customer care, HR, IT and communications to build reputation capability. Design a reputation strategy. Looking at digital communications strategies to build the reputation. Regular reputation reporting. Putting in place measurement and management information for effective reporting at a senior level. Search and social media marketing plays a vital part in the proactive management of reputation. Knowing how and where to be seen, through for example content creation and keyword usage. Listening to conversations among key audiences to learn how you are being understood and talked about. Measuring competitors to see the differing position you hold and increasing that difference through onsite and off-site optimisation. Online reputation management demands a combination of search and social media marketing in this digital and connected world. Where corporate reputations are played out in minutes, it can be one of your most powerful allies.